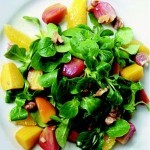 Tip 62- Salads- Do They Help Or Hurt? I like a crisp and crunchy salad, but I love salad dressing. The average woman eats about 70% of her fat calories by eating too much salad dressing. Are salads worth the calories and fat? 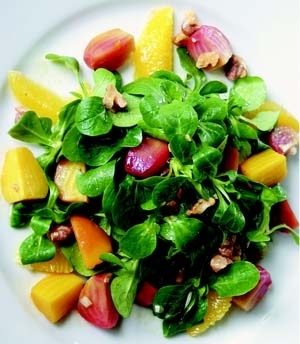 A salad is intended to take the edge off of your hunger and get some veggies into your body. The key point, what salad are you choosing? In a study, women who started lunch with a “low calorie” salad consumed 12% fewer calories during their meal. Eating 12% less at a meal is the equivalent of around 100 calories. This is the difference between gaining or losing a pound this month. Women who ate a “high calorie” salad (Caesar or blue cheese wedge) increased the total calorie intake of their meal by 17%. Eating 17% more calories is about 170 extra calories per day, helping you to gain a pound of fat every 20 days! Today’s tip: Here’s what a low calorie salad looks like: dark greens, 2-3 different types of veggies with at least one veggie from the cruciferous family (broccoli, cauliflower) and a low calorie dressing.